Dabbaghian, M., Babalou, A., Hadi, P., Jannatdoust, E. (2010). A Parametric Study of the Synthesis of Silica Nanoparticles via Sol-Gel Precipitation Method. International Journal of Nanoscience and Nanotechnology, 6(2), 104-113. M. A. Dabbaghian; A. A. Babalou; P. Hadi; E. Jannatdoust. "A Parametric Study of the Synthesis of Silica Nanoparticles via Sol-Gel Precipitation Method". 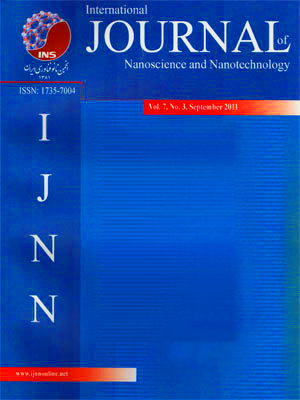 International Journal of Nanoscience and Nanotechnology, 6, 2, 2010, 104-113. Dabbaghian, M., Babalou, A., Hadi, P., Jannatdoust, E. (2010). 'A Parametric Study of the Synthesis of Silica Nanoparticles via Sol-Gel Precipitation Method', International Journal of Nanoscience and Nanotechnology, 6(2), pp. 104-113. Dabbaghian, M., Babalou, A., Hadi, P., Jannatdoust, E. A Parametric Study of the Synthesis of Silica Nanoparticles via Sol-Gel Precipitation Method. International Journal of Nanoscience and Nanotechnology, 2010; 6(2): 104-113. In this study, SiO2 nanoparticles were successfully synthesized via sol-gel precipitation method and the effects of different parameters such as temperature, ethanol, ammonia and tetraethylorthosilicate (TEOS) contents based on water were investigated in a systematic way applying Taguchi experimental design method. It was found that, among all the investigated parameters, ethanol as a co-solvent, had the greatest significant effect on the size of the synthesized silica nanoparticles, so that increasing the amount of ethanol led to initially bigger and then smaller particle size. Temperature had an inverse effect on the particle size, i.e. particle size decreased by increasing the temperature. In addition, the remaining variables, TEOS and ammonia, showed similar trends to that of ethanol in two opposing ways. This novel exploration of size distribution (SD) indicated that particle size was proportional to the SD, so that the narrowest SD was attained at the lowest particle size and vice versa.